I am an unabashed fan of Donna Hay, so I was excited to read of the opening of the donna hay General Store (40 Holdsworth St, Woollahra). It's inside a cute corner shop a little way off the main Queen St drag, and it has a spotless, whitewashed look about it. And no photos (I asked, and they said there were photos on the dh website!??!). 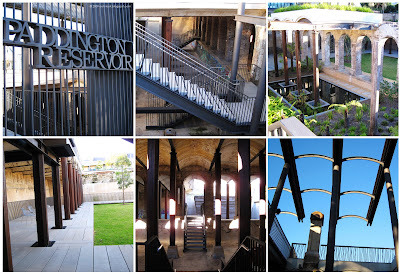 Afterwards, a walk down Oxford St brought us to a new/reconditioned area next to Paddington Town Hall, Paddington Reservoir Reserve. The old reservoir has been spruced up and is now a lovely spot to sit in the afternoon sun and chill and observe the passing traffic. Further along Oxford St and the window of Sweet Art cake shop had this in it - yes, it's a decorated cake, and it must have been about 40cm (15 inches) high! 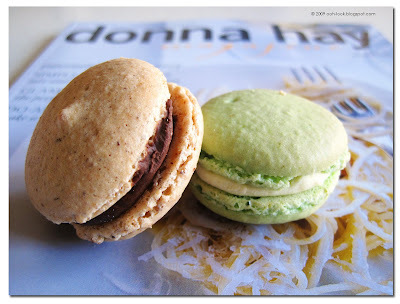 I'll leave you with some of the macarons I got from the Donna Hay store. I will let you know what flavours they are later - pay attention, there will be a Test. The renovated reserve looks so good - very romantic! Omg I need to go an see that hamburger cake! lol. That hamburger cake is awesome, I can't tell whether it's making me hungry for burgers or for cake...probably for both! Those Donna Hay cupcake papers are far too cute, I want some! Oh wow! 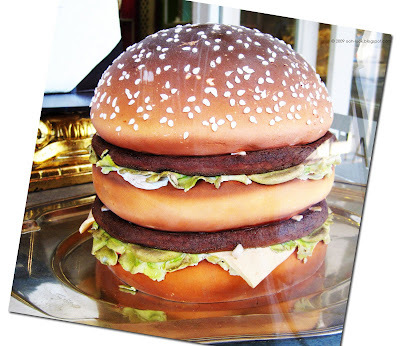 I am totally impressed by the Big Mac cake! It looks so real! Oo, I've been wanting to go to the Donna Hay store. It's a shame they didn't want you taking photos. The maroons are picture perfect, but I guess that's typical for Donna Hay! whooooh the hamburger cake looks so realistic! Love the cupcake papers too! WOOOW! That is literally an awesomecake! how much was it?! I've been meaning to go here for a while! 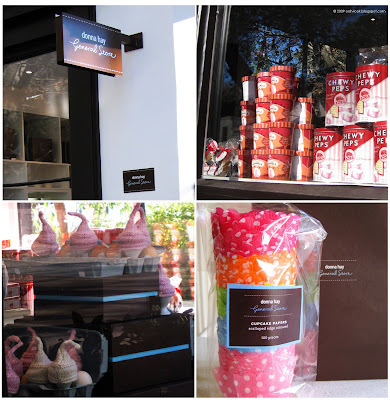 Love the cupcake cases-do you know if they had to French pleated cupcake cases? I've been hoarding my stash of them as they're my favourite but they've disappeared from DJs. wow donna hay general store? oh my god look at that cake! Its awesome! Cake in burger form, have I reached heaven or something? Hi Betty – there is a nice grassy area on top, then the reservoir underneath. It’s really cool! Hi Steph – I couldn’t believe my eyes when I saw that cake! Had to take a picture, of course. Hi Rilsta – it’s very realistic, isn’t it? Bet it’s yummy, too! Hi Arwen – the DH store is worth a visit just to see the lovely glassware and paper placemats and stuff. And yes, shame about the no-photos policy, but I snuck some in from outside. Hi Dutch Girl – I can’t wait to make some cupcakes with those papers! Hi Lorraine – there are heaps of those white pleated papers – go for it! Hi Leona – it’s been open a couple of weeks, and it’s worth checking out - and you can shop down Oxford St later! Hi Maria – hehe, ‘heaven’, I like that! i've been itching to go to the donna hay store! those cupcake papers look so pretty!! and i've seen the hamburger and have the same photo as you - although it makes me wonder how long that cake has been sitting there....it's almost a year ago since i saw that cake..
hi panda - if the burger cake is that old, then it still looks pretty good! I think fondant icing will keep for a long time though it can dry out a bit.